I finally got my Blogpodium 2014 recap written! Yea, me! First of all, I had a great time at Blogpodium , I always do. I was using my iPhone for photos that day, and the venue was a bit dark, so needless to say this post is going to be Texty McTexterson so bear with me. After this Blogpodium was all said and done, I definitely had lots of thoughts about blogging in general, which I will get to later, but first I want to share some of my highlights. I loved the keynote speech by Donna from Funky Junk Interiors. It had humour, passion, and grit. She drew us in with her story, which really showed us how she got where she is today. She did give us some tips and hints but it was her story of perseverance that made us all relate to her and it really set a great tone for the day. I loved the picture she posted talking about people’s reactions when you tell them you are a blogger…. Now, I have been blogging for over four years and generally haven’t really paid much attention to the numbers. Recently, I have been trying to figure out traffic, the best ways to improved my google rank, and other techie things, and well, it been frustrating. So this year, I decided to nerd it up and focus on the technical sessions. I went to 2 sessions. One by Nicki Lamont on Essential SEO and one by Avery Swartz from Camp Tech on Google Analytics. Both were really, really helpful and I left with a much better of a grasp on all those crazy blogging metrics. And can I tell you how much I love Camp Tech? Seriously. They had a nerd station at Blogpodium where bloggers could ask questions and get specific help for their own blogs. As you can see from the photo below, they were pretty busy all day! Also they have the best tag line ever. And I have to say that I was pleasantly surprised by the panel discussion with Jen Flores, Scott McGillivray and Monika Hibbs. I knew Jen would be great….obviously she has the finger on the pulse of bloggers. But I’ll be honest, although I enjoy both Scott’s shows and Monika’s blog, I went into the session wondering what exactly they would bring to the table that would be applicable to the average blogger. Well, I will tell you I was really impressed with both of them. They told their stories which were very interesting in their own ways and also they provided good advice on career paths. And they both had a huge amount of drive, which resonated with me. What I took from that discussion was be true to yourself, make a plan and then go get what you want. Another great thing that I always love about Blogpodium is seeing all the bloggers I don’t see in real life often enough. This year I was so happy to have my friend Sarah of More than Denim, staying with me for her first blog conference. Sarah is a Canadian blogger over at More than Denim, who just recently moved back to Halifax from the US and is excited to get tapped into the Canadian blogging scene. Check it out for some fabulous fashion and food posts. Now on to the more introspective stuff. I have been attending blog conference since before I had an probably had any right to do so. I’ve been to all four Blogpodiums and I also attended Alt Summit in Salt Lake City in 2012. Looking back, I will say that for the first 2 Blogpodiums and Alt, I KNEW NOTHING. I learned a lot but maybe not a lot that applied to me directly since my blog was so small and newer at the time. Now, that being said, my blog isn’t much bigger now than it was then, but I would like to think it’s slightly more sophisticated. I certainly would say that the last 2 Blogpodiums were the most rewarding. but also very different. Last year, I left feeling super inspired and motivated. For me it was about the relationships and connections, but looking back I didn’t leave with a huge amount of tangible information to actually apply on my blog. This year, however, while I didn’t leave with a sense of euphoric blog bliss, I learned a ton and left with so much information that I could put into action right away. It wasn’t better or worse than last year, just different. But I think maybe that is the evolution of attending blog conferences. Every experience is unique and speaks to you differently. Now, it’s no secret that the word on the street is that that blogging as we know is dying. Readership is down, comments are down, major publications in the US are shutting down blogs. And for sure, all that may indicate a significant change to blogging. The next big thing may take blogging in a whole new direction. Big changes. But just because something is changing it doesn’t mean it’s dying. And I think something is missing from this conversation and that is that people don’t ever get tired from hearing stories. About a month ago I read great post written by by Erin Loechner over at Design for Mankind titled Blogging, Now that was posted back in August and talked about the state of blogging. I think Erin’s take on the topic is bang on. I would encourage you all to take a read of the entire thing but I want to share with you a quote from the end of that post….. Truth. Look at my Blogpodium highlights above. Do Donna and I have the same aesthetic? No. Do I love every single project she does? Not necessarily. But I still loved her keynote and love how she writes on her blog. Why? Because she is genuine, tells a story and I connect with that in some way. And then, Scott and Monika, two people that I didn’t anticipate taking much away from who really surprised me, and why? Because they told their stories before they launched into the advice. I understood where they were coming from. Genuine stories make all the difference. Isn’t that how blogging started? It doesn’t matter what a post is about or how short it might be, if you there is a reflection of you and your story weaved in there in even the smallest way, someone is likely to enjoy it. The last 2 weeks have been busy. There was Blogpodium, the Upcycle Challenge at the Fall Home Show, a blogger brunch with Brian Gluckstein at the Princess Margaret showhouse in Oakville, Diner en Blanc and the Habitat for Humanity Women’s build! Hectic, but fun. I eventually am going to get a chance to blog about some of these events but for today I am sharing my Last Week’s Loves. 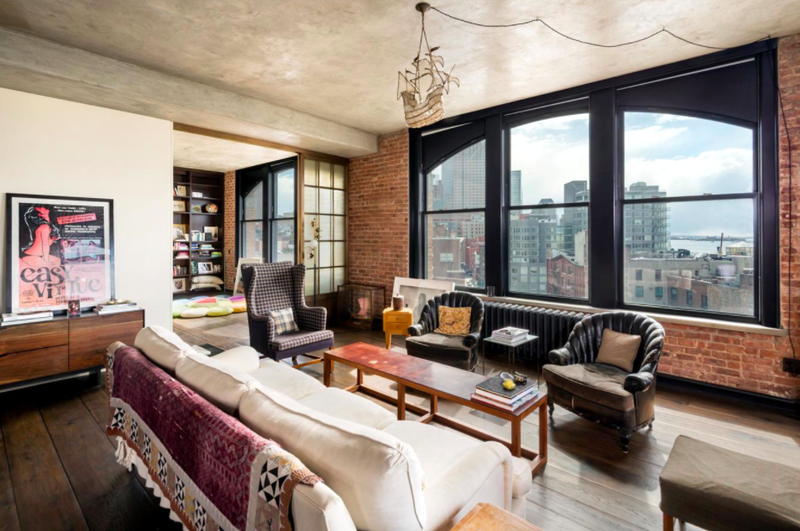 Did you know you can rent Kirsten Dunst’s apartment in New York? I learned this from this post from Escapade. And what a lovely apartment it is. It better be for $12,000 per month. Design Sponge did a round-up of cool DIY stair runner ideas……like these super cool ombre stairs. A great way to add interest to your stairwell. This is glamourous featured the Oscar de la Renta Spring 2015 ready to wear collection. It is gorgeous. Do head over and check out the rest of the amazing pieces. And that is all I have for today. Haven’t had a much time to get caught up on my blog reading over the past couple of weeks but I hope to have a bit more time this coming week. Have a great week! Hoping you all had great weekends. It was a nice weekend here in Toronto, and actually warm enough on Sunday to believe that summer maybe isn’t QUITE over yet. And I’m crossing my fingers for a warm September too. And as it is Monday, here are some of my loves from bloggerland last week. This recipe that Jacquelyn featured on Lark & Linen looks delicious. A must try for me. For those of you considering installing radiant heating in your homes, the Dreamhouse Project featured a great summary of things you might not know about it in this post. 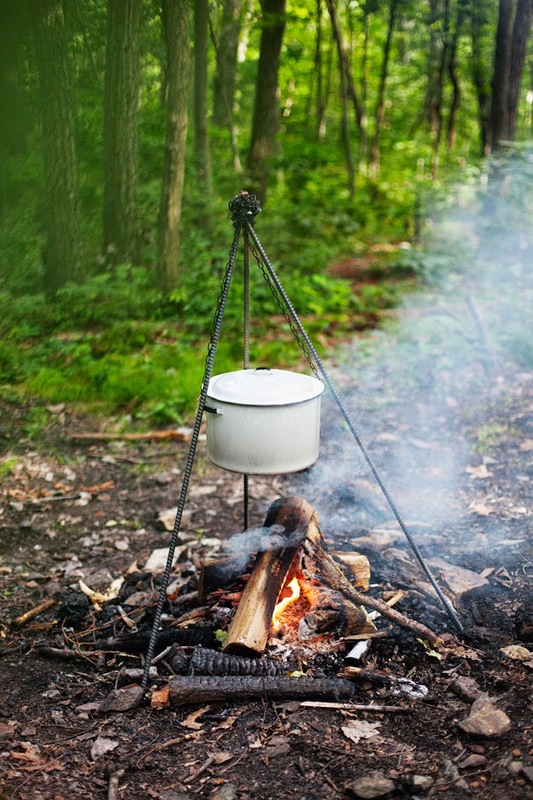 Summer fires, either for camping or on the beach, will be winding down soon, so why not make the most of it and cook on one. And you could do so much more easily with this DIY cooking station found on Poppytalk. Don’t know you love it when good people have exciting news? 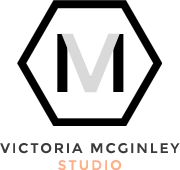 Well, I love it when good blogger peeps do too…..
Victoria, formerly of VMac & Cheese has rebranded her blogging and styling prowess into one new site called Victoria McGinley Studio and Blog which launched last week. You can now find all the things you loved about VMac & Cheese and Vivaleur in one easy to navigate and beautifully designed place. 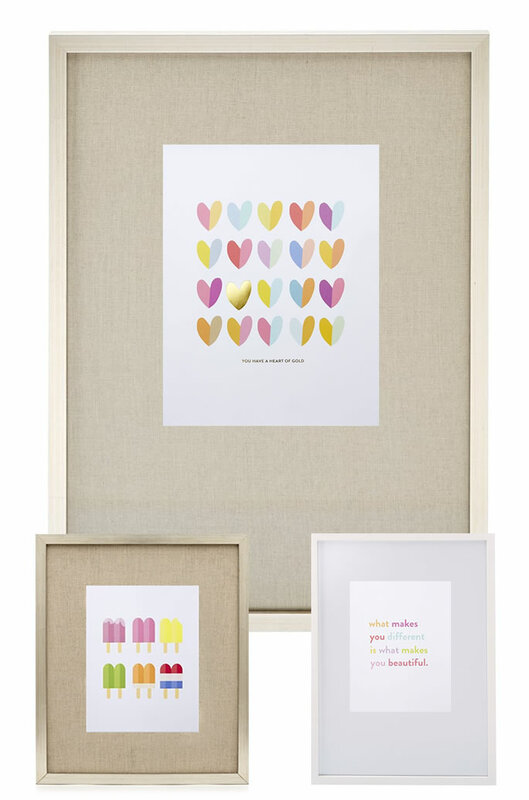 And in other awesome news, my friend Lindsay Stephenson Little House Blog and Penny Paper Co. recently announced that her adorable Penny Paper Co. prints are now available at Indigo! You can find them here! Good news all around! Have a great week! As the first weekend back after my vacation, it was full of projects and errands. I finally finished the two client chairs I’ve been working on for the last few months. Yes, months. The project was wrought with frustrations that I will get into when I post the before and after. But needless to say I’m happy that they are finally complete! I also worked on my 2014 Upcycle Challenge Project for the Toronto Home Show coming up in the Fall. Stepping out of my comfort zone on this one and I’m crossing my fingers that it works out. I did so some other non-work fun things like visiting the Evergreen Brickworks Farmers Market, brunch and dinner with friends and of course, catching up on my blog reading. There were a few blog posts that made my Loves list this week. I hope you enjoy! This stunning photography collection by Australian photographer Tom Blachford, called “Aerial Summer” on This is Glamorous. You can see a slide show of all the lovely works here. These opal circle earrings by WWAKE on Design Sponge. I always loved opals as a child, perhaps because of the lovely iridescent quality. You can read how WWAKE came up with the design of this simple pair of prettiness here in the post. 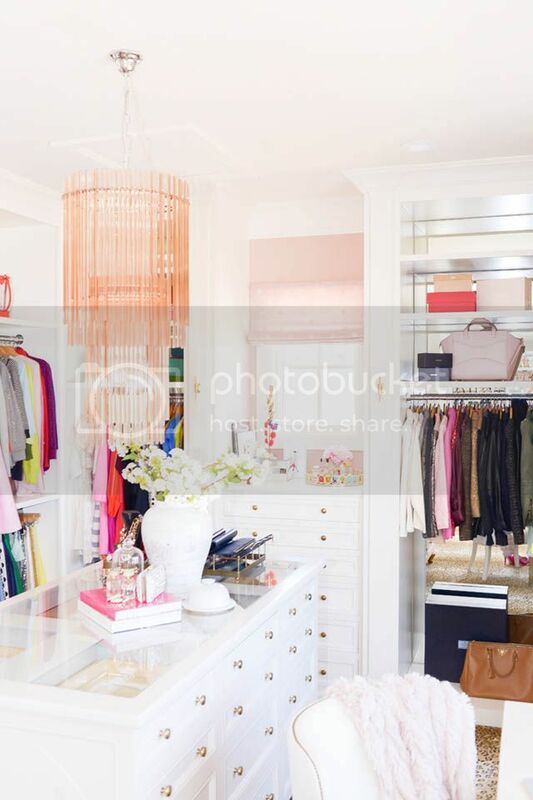 This closet by Rach Parcell of Pink Peonies found on Marcus Design. If only I had the space and the shoes (and $$) to have this closet. See more pics here. 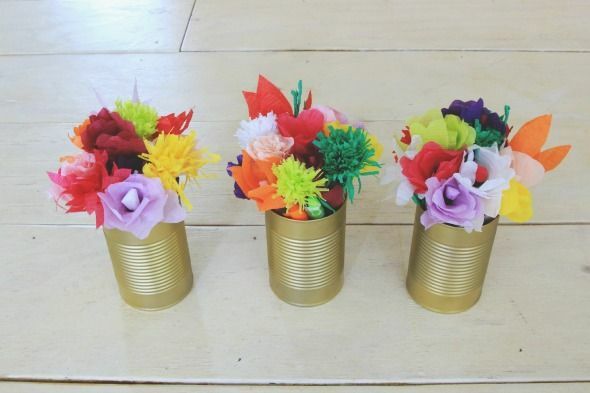 This crazy cool DIY on Little Green Notebook. If you can believe it, this is a container of colourful Sharpies! Yes, this would be a time consuming project, but you can’t tell me these won’t look 100% better than a regular bin of markers on your desk. I hope you all had a great weekend! It’s been a couple of weeks since I’ve done a last week’s loves post, so I thought I would get back to it this morning! Here we go…. I loved these tips on how to style your coffee table from Coco & Kelley last week. I always love reading Lynne Knowlton’s blog, and I really enjoyed all the avocado tips and tricks she shared last week in this post. As usual, there was just the right amount of hilarity balanced with helpful information. My family’s cottage is on the ocean so I spent a good chunk of my childhood summer days playing at the beach. I also recall having to hose myself down with freezing cold water when home to ensure that we didn’t trek a whole bunch of sand inside the cottage. 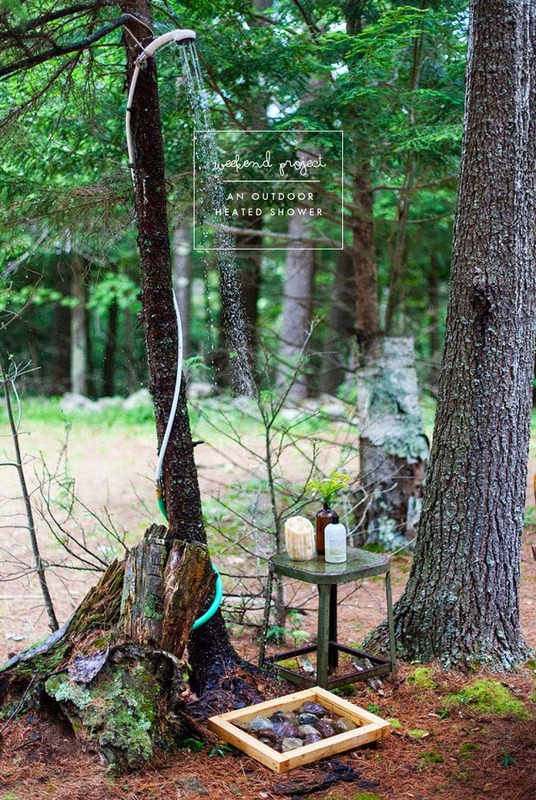 So, this DIY outdoor heated shower found on Poppytalk last week would have been a welcome addition at our cottage! I love cherries, but I have to say I hardly ever cook or bake with them. However, after seeing this post over at Camille Styles of the 10 best cherry desserts, I’m inspired to start! That’s it for today! What inspired you last week? Before I get into my last week’s loves, I need to wish one of my lovely blogger friends a very Happy Birthday. You know when you meet someone and you think, this person is just a genuinely GOOD person? Well, that is how I felt immediately when I met Christine Dovey of Bijou and Boheme. Despite her immense talent as a designer/stylist/artist, she is humble, gracious and still seems surprised by her success. So Ms. Bijou I hope you have a lovely day and a spectacular #giftoffancy night with your awesome-sock-wearin’ husband. Now back to my loves of last week! 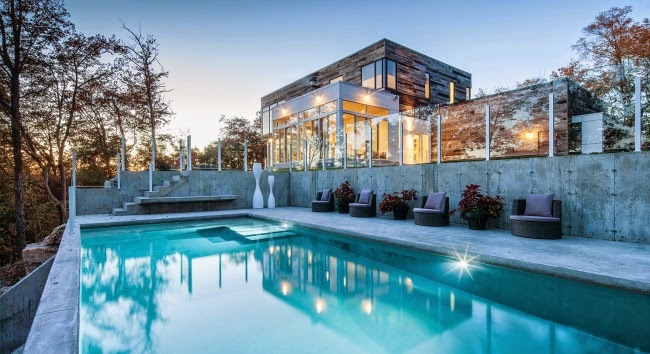 Miss Sheralee over at Escapade shared this lovely modern country home designed by architect Christopher Simmonds in Gatineau Hills, Quebec. Really love the both the space and the setting. Check out more photos and info, here. I really enjoyed this read from Erin at Design for Mankind on the Small Things. An interesting look at the things we focus on during an upsetting situations and a good reminder to not let that cloud all the rest of the good stuff. 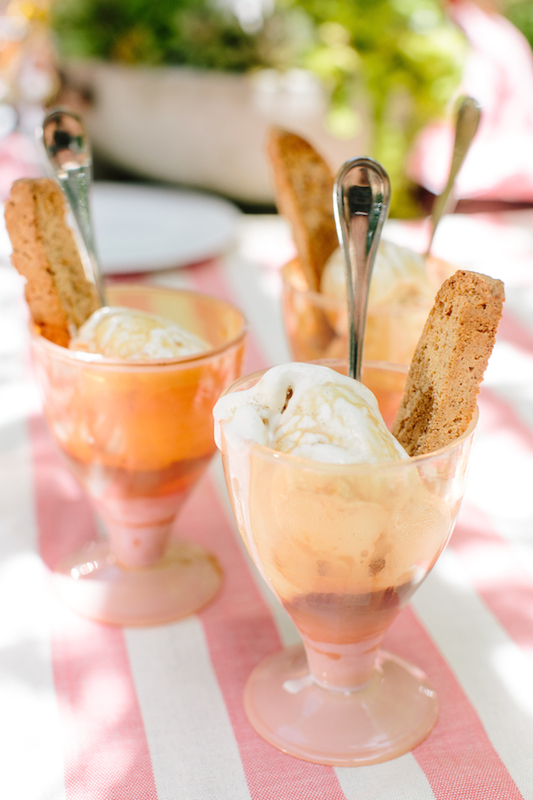 This affogato recipe found here over at Camille Styles (by Annette Joseph) looks scrumptious. It’s like a coffee ice cream float….on crack. The good kind. This is glamourous shared some photos of the super low-key Olivia Polermo and German model Johannes Huebl. So low-key that the bride wore separates! But obviously still looked stunning. I love this casual look for the nuptials. You can see more photos and get the goods here. I hope everyone had a great weekend! I’ve been on a week-long blog hiatus but I’m back today with some of my blog loves from last week. Pretty sure you won’t be disappointed if you click over to the posts I’ve featured, but read on and see what you think. 1. 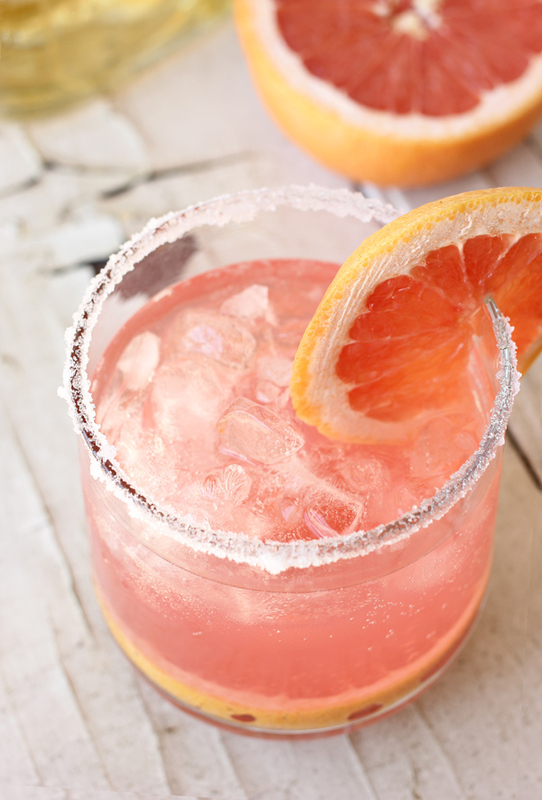 Oh My Daily Randomness, your summer cocktail recipes made my day. It’s a perfect time of year to enjoy these refreshing drinks. Find the details here. 2. I really enjoy the sound of wind chimes. There is something soothing about them. I think it would be nice to have some in my backyard, but I live REALLY close to my neighbours and maybe they won’t like the noise. 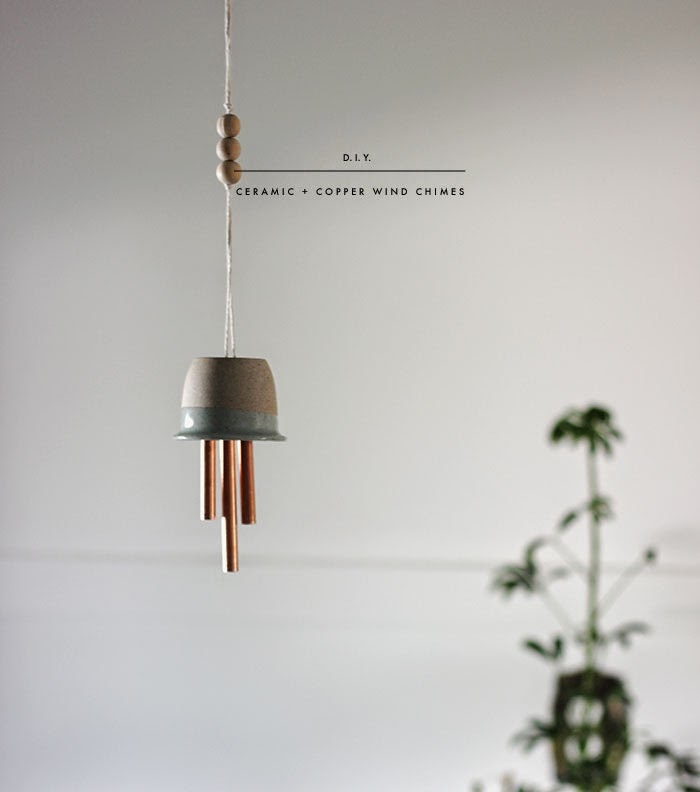 But still, I definitely did a double take when I saw these DIY wind chimes on Poppytalk. Do I need another project…um, no. But these are tempting. 3. I love me some delicious seafood. So my mouth was watering when perusing this grilled octopus salad recipe posted here by the lovely ladies over at Life Over Easy. Yummy. 4. 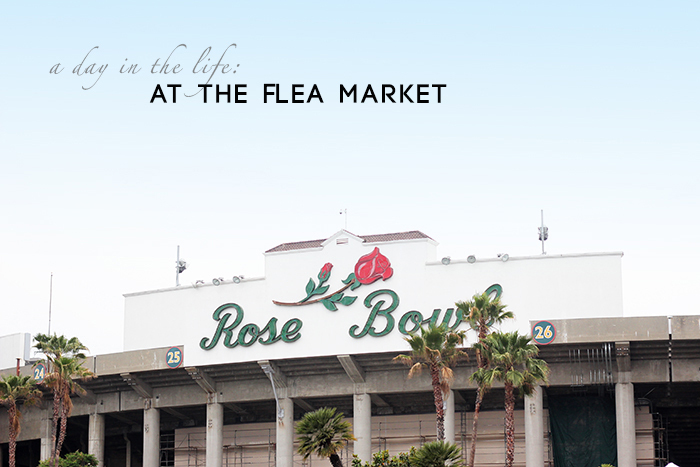 A great read, as always, found over at Style by Emily Henderson with tips on spending the day at a flea market. I always so love reading her posts. Awesome. 5. I used to read a ton, but I find it hard to read little bits at night. I need long periods to get into a book, which I don’t get often. But I ALWAYS read at my cottage where I will be in just over a month. 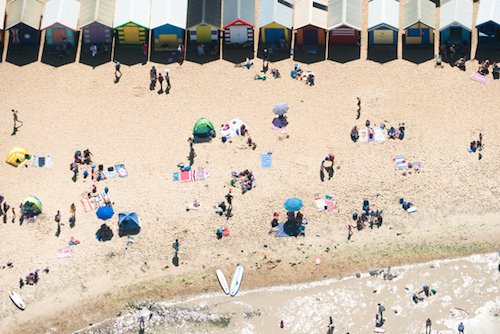 So, this list of fave summer reads from Design Sponge may just come in handy. And that’s all folks. Hope you enjoyed these as much as I did! I hope everyone had a great weekend, and to my American friends and family I hope you are enjoying your Memorial Day weekend. As is customary here at Recreated, Last Week’s Loves is on the agenda today. Hope you enjoy some of my fave links. Loved these punny thank you gift labels found over at Brooklyn Limestone this week. 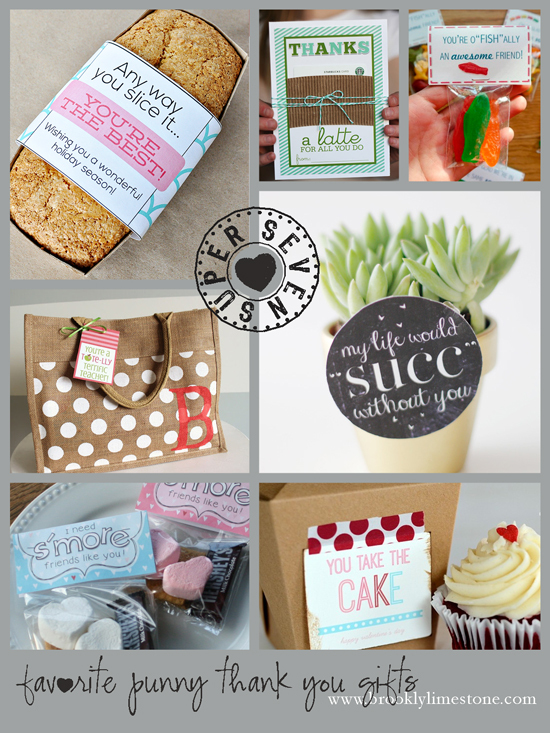 And you can get free printables of all of them by clicking over to the post here! Check it out! Now that the weather is finally feeling like summer is coming, my mind can finally move toward summer foods. Is there a better summer staple than a popcicle? 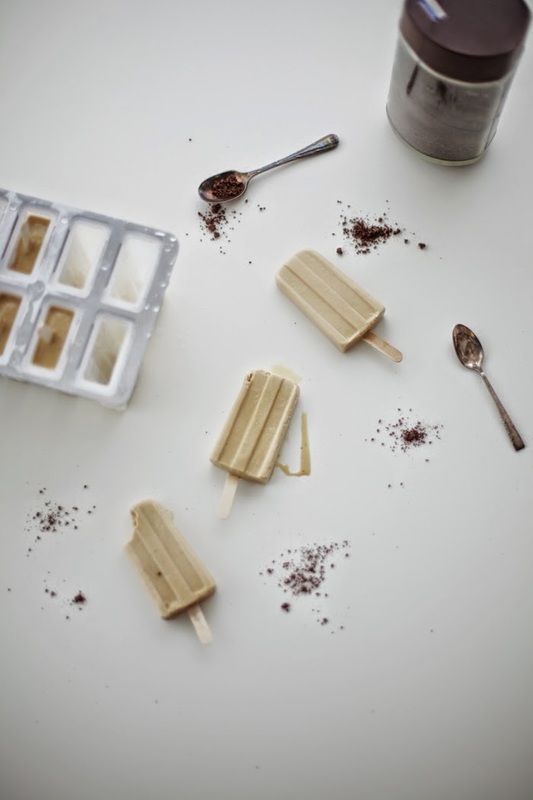 And why not add some caffeine to your cool treat with these awesome milky Vietnamese coffee popsicles . Yum. Looking for some cool DIY outdoor lighting? Look no further than this post by Alex over at North Story. A great new use for pickle jars! Click here to see how to do it yourself! 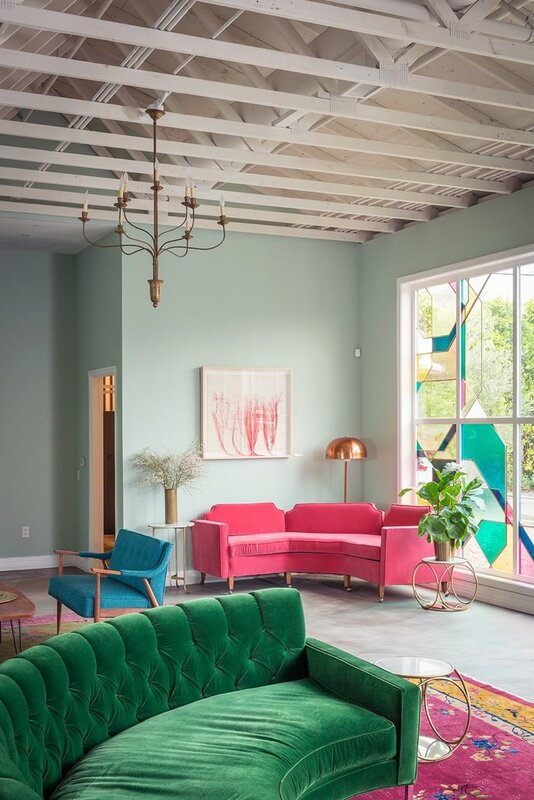 And last but certainly not least, check out the Fig House lounge before and after from the ever amazing Emily Henderson posted on her blog this week. What a transformation! I love this room. Pretty sure it has a lot to do with the curved sofa. To. Die. For. Better late than never, right? I hope you all had a great weekend. I’ve a few posts planned this week – hopefully I’m able to execute them with my lack of resources…did I mention I lost my camera on my trip to Victoria? That’s also why I didn’t post the pictures yet of my friends lovely wedding yet. Trying to edit my iPhone photos to be sufficient to post – and there aren’t many. (insert sad face). Anyhoo, I’ll have to make due for now. In the meantime, today I have my usual Monday last week’s loves for you. Hope you enjoy. 1. Looking at this wild garlic bread found over at Decor 8 last week makes my tummy scream grumbles of joy. Warmed up with a big slab of butter? Oooh yes. You can find the whole recipe here. 2. I love it when I read blog posts where the author is totally honest and true to themselves. Miss Sara from Saige Wisdom always writes this way but her recent confessions post had me laughing out loud. You can also see her amazing new t-shirt design in this post too. I need one. 3. Was excited to learn about glassybaby through a post by SF Girl By Bay. A lovely story of a company being built on charity. Click here to read more. 4. While reading Friday’s post from a Diary of Lovely, I discovered Ask Her Friends a new site that helps you buy presents for those difficult people on your list. You can read about it on a Diary of Lovely (along with her custom curated list of gifts) or on their website. 5. Loved this feature on the Mercury Inn in Portland, Maine found over at Design Sponge. What a fun, modern space. It looks like someone’s home more than a hotel. Click the link for more pictures. Happy Monday! How was the weekend? Mine was busy preparing for my parents to come visit and trying to finish up a client project. Also, there were some big changes to the look of my backyard this weekend which has me in full outdoor space planning mode. I’ll share more on that tomorrow. But for now, here are some of my loves from last week. Do you have anyone in your family who is really into genealogy? I have a few in my family. Well, while perusing this post on Poppytalk I found these beautiful handmade family trees from Eva Juliet! 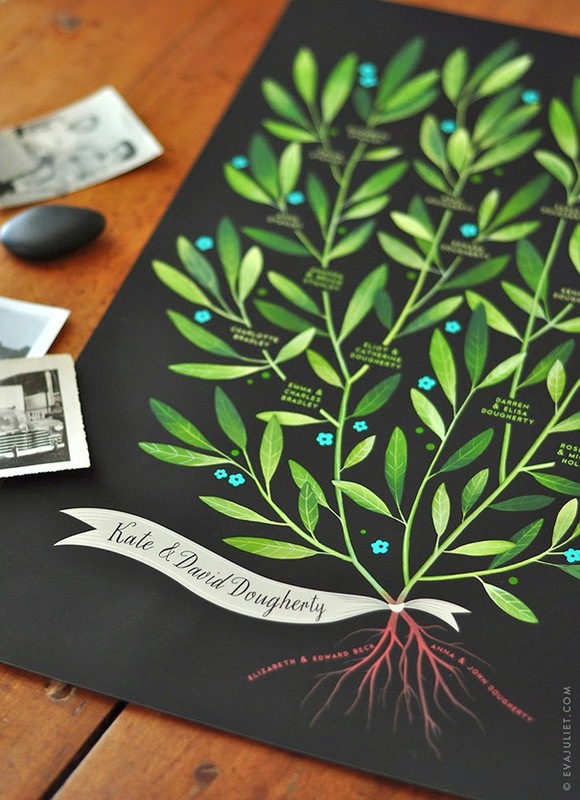 So pretty and would make a great gift for a genealogy enthusiast. SF Girl By Bay blog inserted a little Canadian content into this post when she posted this lovely cottage reno in Montreal owned by blogger Sarah Brown. You can see more pictures of the space here. This post over at Damask et Dentelle introduced me to Kozza, and online store which carries home textile goodies like the gorgeous pillow below. (She is also doing a giveaway right now for a $75 GC so be sure to enter when you head over. 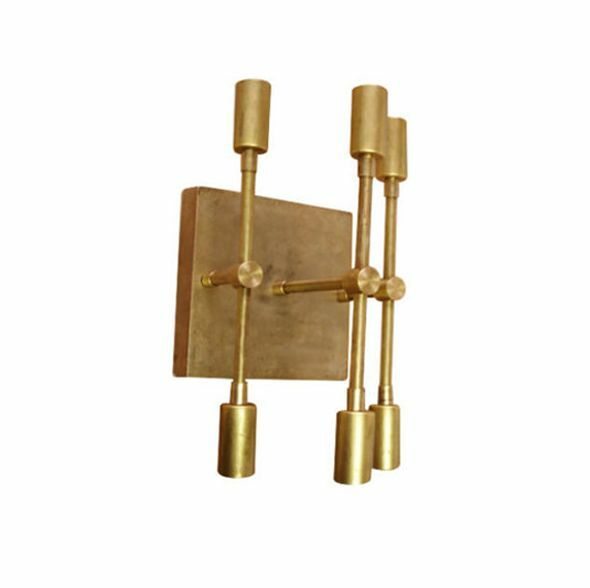 Jenny over at Little Green Notebook had a great round-up of affordable brass sconces. You can check out this fabulous one below and more over here.